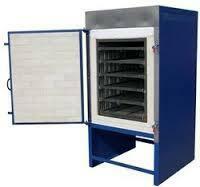 Manufacturer of a wide range of products which include annealing ovens. By capitalizing the skills of our professionals, we are able to provide quality approved range of Annealing Oven to our esteemed clients. This Annealing Oven is made at ultra-modern manufacturing unit using the premium quality components and advanced technology in conformance with defined quality standards. Being a quality-oriented organization, we assure our clients that our entire products range is excellent on counts of quality, reliability and durability.